Destiny's new zone has been leaked through the Xbox One store and it looks like we're off to the Plaguelands in the Rise of Iron. From the official description, the Plaguelands is an activity area and also a brand new social space. The new Raid will take players deep into the Plaguelands as they uncover the deadly plague that the fallen have unearthed but never fully understood. Back in 2015 when the House of Wolves expansion released, we also received a new social area called The Reef. This social space had it's own dedicated location on the map, and was also the only place to receive new queen bounties from Petra, engage in Prison of Elders through Variks and also purchase passage tokens for Trials of Osiris PvP events. It's highly likely that the Plaguelands Zone will include a familiar mix of new NPC's for bounties, quests and gear. Lord Saladin, who has been mentioned by name in the official expansion description, will no doubt be the one who expects us to venture into the raid. Possibly behaving like Eris Morn from The Dark Below, Saladin is bound to offer us a series of quests as a pre-requisite to unlocking the raid in full. Beside NPC's and vendors, this social space will also be a great place for guardians to find like minded players and team up for the new Raid, knowing full well that anyone in this zone has purchased the expansion and will be hungry for new gear! From the small video teaser we've seen so far, there's a short glimpse of what appears to be the new faction in Rise of Iron. They appear to be leaving the collapsed city wall and a solid guess is that this faction are the "fallen mutants" who are scavenging the tombs of the Golden Age. Although, it's also possible that the mysterious Faction lies deeper underground and it's only because of the Fallen that we now have to face this unknown threat with the help of Lord Saladin. 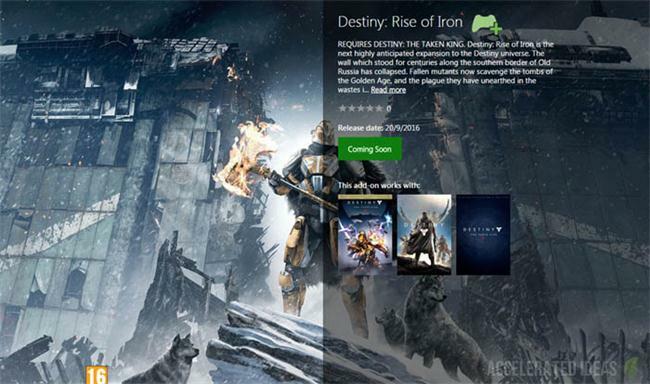 Requires Destiny game and The Taken King (includes Expansions I & II). Sold separately. 14 GB available hard drive storage space required as of 09.16.